An Options Writer makes his money based on your IMPULSIVENESS. He wants you to get all EXCITED on either side, Bullish or Bearish, and jump into an Options trade that is Out of the Money. Because that’s his bread and butter. This profiteering is not evil, it’s business. It is what all Options Writers do all around the world. The question is whether you will get suckered in and pay a high options premium, especially after reading this post. Will you still enter into an expensively priced options trade? And this post will coach you how to predict stock price movements, and how to figure out whether the options premium is reasonable without having to rely on Options Greeks like Delta, Gama, Theta, Vega. Also, remember that this post is applicable for stocks in the normal course of business. If stocks are hit by news, then this post doesn’t hold good. Let’s take an example – BPCL. Let’s figure out its minimum and maximum price movement per day, month and year. We have to rely on good old Google and TopStockResearch, a very helpful website with rich data on technical analyses. For some reason, this valuable data is not directly linked on the Top Stock Research website. Therefore, you need Google. So, let’s Google “BPCL Volatility” (without the quotes). What happened to BPCL recently was extraordinary. Such events do not happen daily, and therefore should not be considered while estimating daily average volatility. If you remove the massive volatility of the latest 2 days, you will realize that the BPCL counter moves between 2.5% and 5%. Let’s put it at at 3.5%. Let’s now check the price range for up to one year. 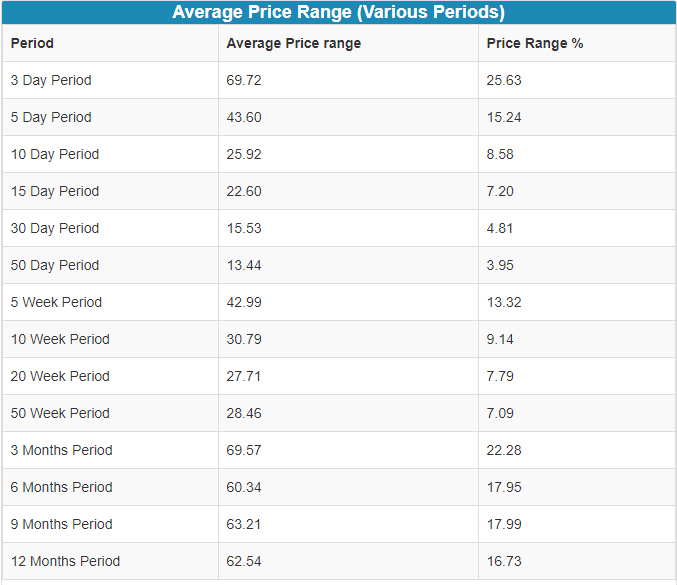 BPCL’s yearly volatility ranges between 7% to 18%. I’ve ignored the recent spikes. You can cay that 13% would be BPCL’s annual volatility if it were not impacted by news, like it was recently. THE FIRST LESSON IN OPTIONS TRADING FOR PLAYERS WHO TRADE FOR UP TO EXPIRY (30 days) IS TO PLAY WITH A CE OR PE AT A STRIKE PRICE THAT IS WITHIN THE YEARLY VOLATILITY % OF THE CMP. THIS WILL ENSURE OPTIMUM PROFITS (OR LOSSES). I’d say that 7.5% to 9% would be a safe range in the case of BPCL. As an example, if BPCL is 265 and if you want to play OTM Options, don’t exceed 8% on either side (245 for PE and 285 for CEs). You will have a bigger chance of making money if you play OTM options within this range. OTM Options that are lower or higher than the levels specified may expire worthless or you may not make enough to justify your investment. Of course, as mentioned earlier, this volatility will spike if the counter is hit by unexpected news. Intraday options players can take their chances with strike prices that are within the daily average volatility. Remember that news-based volatility dies down in 2-4 days, so do not assume that the same kind of volatility will continue for a long time. Be quick with your profits or losses. A long strangle involves buying equal lots of OTM CEs and PEs for the same expiry. Long Strangle traders can compare the total premium paid to the average volatility and enter into the trade if the combined premium is reasonable. The daily average volatility is 3.5% to 5%. The 1100 CE was priced at 20 and the 1000 PE was priced at 26 this morning. The combined premium works out to 46, or 4% of the CMP. Therefore, RIL could be considered for a long strangle today. Part B: Is The Option Premium Reasonable? You would have heard about Delta, Vega, Gama, Rho – and I’m sure that many of you would be struggling with the concepts. But no worries, here is an alternative method that will help you figure out if the premium is reasonable. — The monthly interest rate at which you can borrow. These days private limited companies have started borrowing at 19% per annum. So it would be safe to assume that the monthly interest rate is 1.5%. This can vary and therefore you should keep tabs on the current rates. — The trend. If the trend is up, the CE should fetch a higher option premium and if the trend is down the PE should fetch a option higher premium. There’s a technical setup for determining trend. Notice that after crashing 22%, BPCL held more or less steady for eleven 30-minute candles. That’s like holding steady for 5+ hours that was being beaten black and blue during the same time. But the price was way below the 20 EMA and slightly below the VWAP. Also the EMA line was falling (sloping downward). However, this was negated by price action reading (the 30 minute candles). The chart implied that the crash in BPCL for that day was done with and if at all it falls the next trading day, it won’t be much (unless it’s hit by another round of bad news). So, I’d say that the BPCL volatility is back to normal. The closing price for the BPCL 270 CE was 15.50 – 20.50 – A massive Rs 5 spread. At Rs 270, the interest for 20 days (we had 20 days to go for expiry as on 5 October) works out to 1%, and that is Rs 2.70. Rest of the premium of Rs 17.80 (Rs 20.50 less Rs 2.70) represents volatility and trend. However, we have seen that on Friday the trend had stabilized for eleven 30 minute candles on 5-10-18. Hence, the trend premium should be marginal, if at all. We also say that once the trend stabilized, so did the volatility for the better part of the day. Hence, we can calculate the options premium as Rs 2.70 for the interest, Rs 9.45 for the volatility (3.5% as above) and let’s say Re 1 for the trend, making it Rs 13.15. This is the reason why you see that most of the buyers are standing at 13.50. 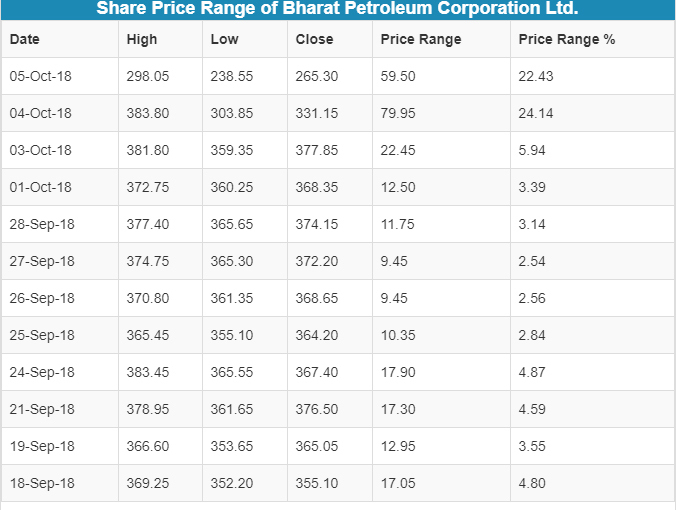 If you have purchased the BPCL CE at 20+ on Friday, you have paid a high price (unless there’s follow on news on Monday). Now let’s turn to the BPCL 260 PE. The closing price for the BPCL 260 PE was 14.70 – and there were no sellers. Demand outstripped supply and Options Writers were reluctant to sell. Trend was down for the day. 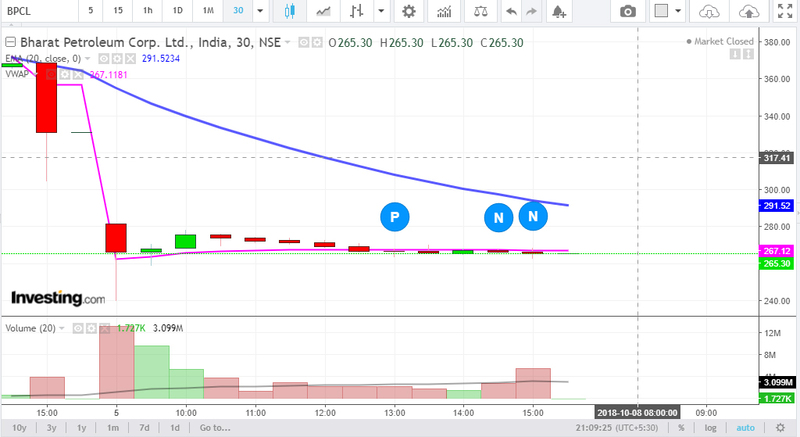 Though BPCL stabilized after falling, it did not recover. Therefore there would be a premium based on the trend. The volatility premium at 3.5% of Rs 260 was at Rs 9.10. So you get a premium of Rs 2.60 + Rs 9.10 + another 2-4 bucks for the trend which was uncertain for the options writer, but given the massive fall in the morning, it was necessitated. That gives us at least Rs 14, and this is the reason why there were no sellers at this price. As you trade deeper at Out-of-the-money strike prices, the volatility premium dies but the trend premium stays. For example, if you’d have bought a 250 PE or a 280 CE, all your trades would have generated loads of cash for the options writer. But to be fair, there would be no way of knowing at the start whether BPCL would have crashed or risen further. THEREFORE YOU MUST ENTER INTO AN OPTIONS TRADE ONLY AFTER THE TREND FOR THE DAY HAS BEEN ESTABLISHED. To double check how the stock is trending during the day, use our 15-minute trading strategy. Play with strike prices that are within the volatility range, as suggested above.Finally, remember that this is rule of thumb that I apply to my trades. It works for me, but am uncertain if you’d play by the book like I do. If you don’t play by the book, it won’t work for you. If you are already into the delta, gamma, vega, etc., thing, then I suggest you don’t follow this guide.If you have anyway decided to use the guide, perform paper trades and become comfortable before doing the real thing. I’m hopeful that this article will help you understand price range and reasonability of options premium, and stay one step ahead of the options writer. Good luck. 5 Comments on "How To be One Step Ahead of an Options Writer"
very useful. thank you for sharing . Can you share some excel file to calculate in minimum way. How does it work with HDFC with 2% voltality?? ?